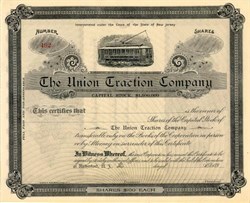 Beautiful unissued RARE certificate from the Union Traction Company issued in New Jersey. This historic document was printed by Albert B. King and has an ornate border around it with a vignette of an electric trolley. This item and is over 107 years old. We have only seen 4 of this company's certificates and beleive they are RARE. Incorporated 1900 as consolidation of the following companies. Sold 1910 to Public Service Corp. of New Jersey. Bergen County Traction Co. - opened 1896. Ridgefield & Teaneck Railway Co. In 1903 acquired the following company. Hudson River Traction Co. - incorporated 1903, acquiring Newark & Hackensack Traction Co., which in 1899 had acquired Union Traction Co., opened 1897.